UPDATE: Enjoy this project for the kitchen of our former home. We’ve moved and are giving our new-to-us home a complete remodel. I’ve completely changed my style! Click HERE to take a look. 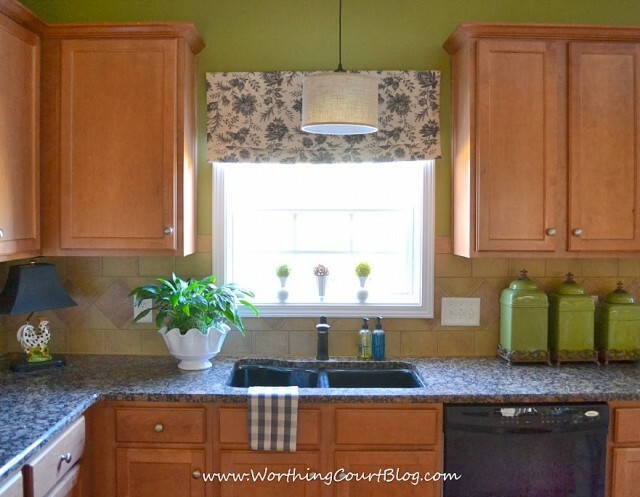 I’ve been chipping away at a farmhouse facelift for my kitchen! 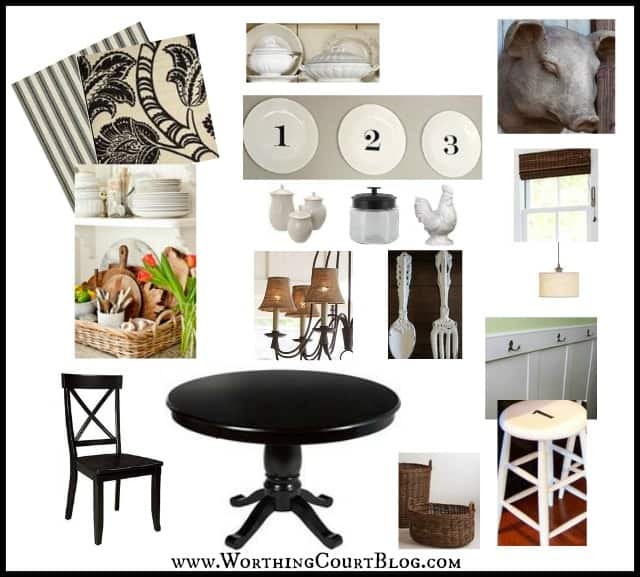 Here’s the farmhouse style mood board I’m working off of. In case you missed it, you can read all about it HERE. Other than replacing my old table with the new black round one, the most drastic changes that I’ve made are to replace the window treatment and the can light above my kitchen sink. 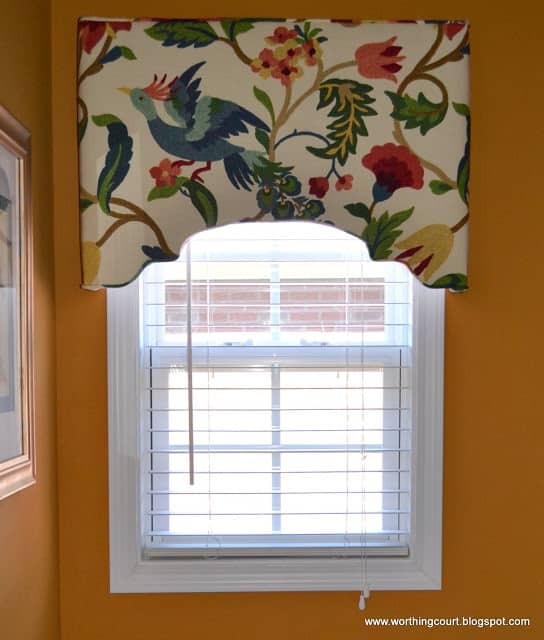 The roman shade is a faux one and it’s no-sew too! I’ll share the directions with you soon. I gave serious thought to repainting the walls, but then I remembered how much I adore black, white and green together when I found the black and white fabric. I’m afraid that I can’t tell you what the name of the fabric is. The place where I purchased it won’t give out that information. I’ve been adding other farmhouse touches here and there too. Like these cute porcelain urns that I placed on the window sill. You might remember that I used a couple of them in a vignette on my kitchen island last week. My footed, fluted bowl is such a versatile piece! I’ve already used it in another vignette too. My sweet daughter added the typography for me with her Silhouette. I haven’t decided what to do about my little lamp in the corner. I kind of love it just the way it is. What do you think? All in all, I’m in love with the way that the kitchen is coming along! In case you’re wondering, this is what this same corner of the kitchen looked like a couple of weeks ago. Do you like to dress your windows? Here’s another treatment that you might be interested in with step-by-step directions for making your own! 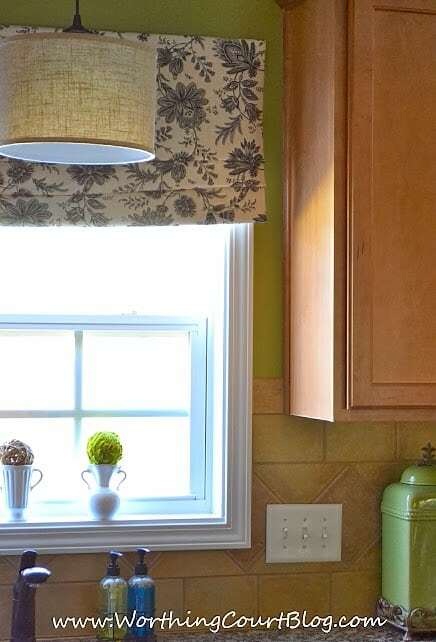 And find the tutorial for how to Make A No Sew Faux Roman Shade HERE. Find out How To Change A Recessed Can Light Into A Pendant In 5 Minutes, Without An Electrician HERE. 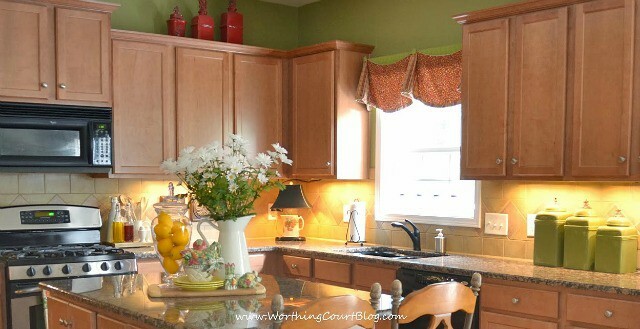 I’m lovin’ the farmhouse feel you’re adding in your already beautiful kitchen! The numbered plates are so fun, and your no sew roman is beautiful. Love your new light, too and look forward to seeing more! Aw, thank you sweet Becca! Trying so hard to de-redify and de-goldify things a bit! Thank you GF. I’ll leave the dough bowl to you in my will….mkay? Thank you, Liz. So glad to see you back in blogland! Your kitchen is looking wonderful! I love the window treatment you made and all of the white and green looks great with the black and white. Thank you, Penny. I had forgotten how much I like this color combo until I brought the black and white fabric home! Suzy I think this looks great and that fabric is so pretty. Can’t wait to see how you made this. 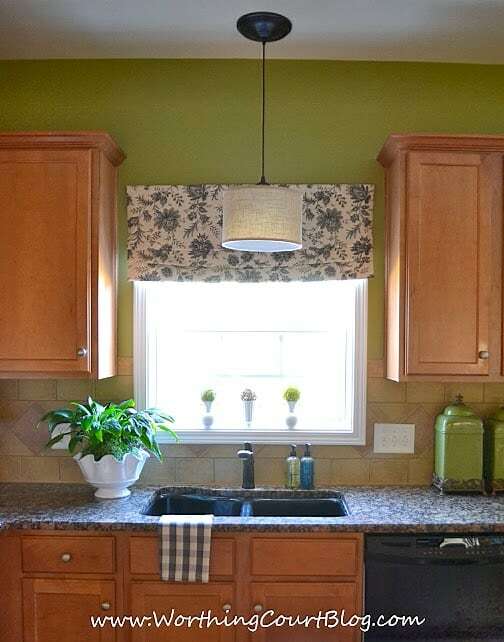 I also love the light hanging over the sink. Thank you, Cynthia! I was surprised at how much I like the looks of that pendant. It gives off so much more light than my old can light did. 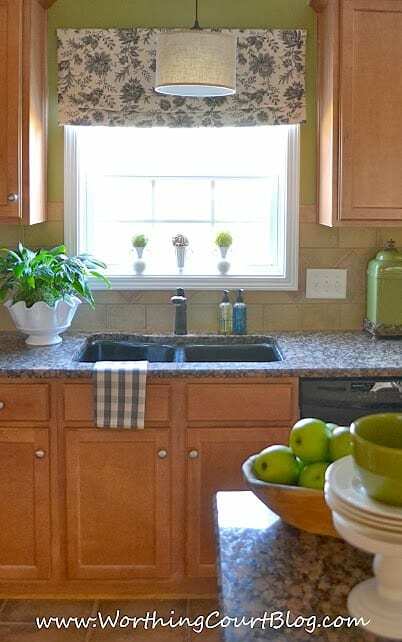 You make the most gorgeous window treatments!…Love seeing you transform your kitchen! This looks great! 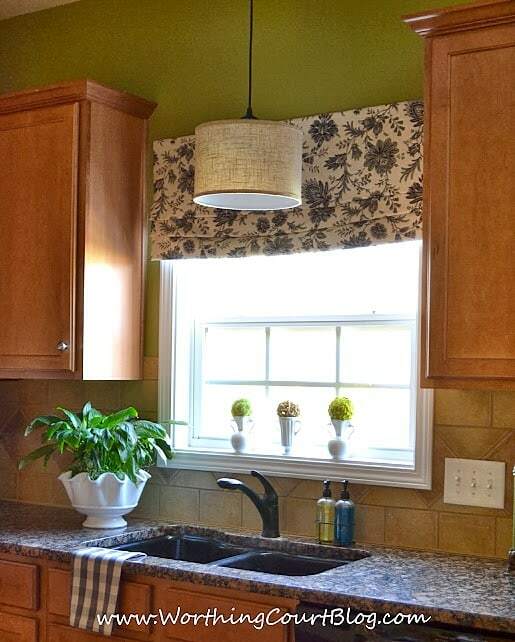 I like that new light fixture over the sink and the new window treatment. The touches of white are great too- and the rooster lamp is cute! 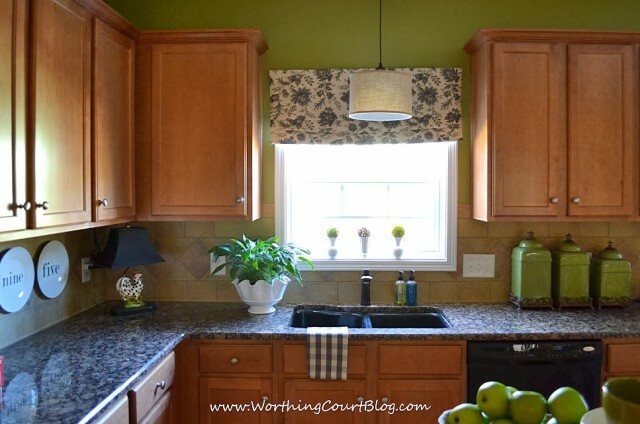 Great touches….Love those green canisters! Such a pretty ktichen. 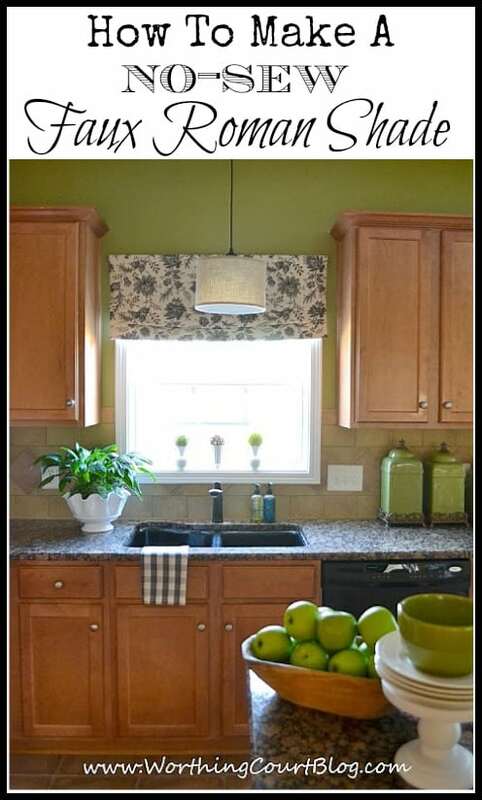 I love the warm touches, especially the green apple color. I can almost smell them when I see that color. Really beautiful ~ I love the black, white, and green combo! Your window treatment is fabulous! Thank you for sharing! I especially love the white vases/jars with flowers on your windowsill! I love how the roman shade turned out Suzy! It gives the kitchen a polished and modern look. 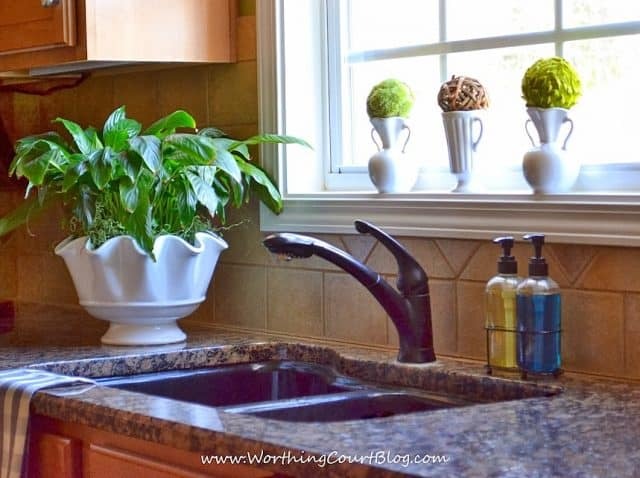 By the way–your kitchen is beautiful! 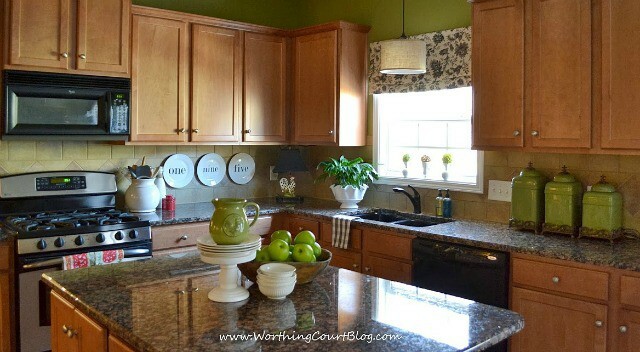 I love the granite countertops and cabinets. Can’t wait to see what you do with it!